Verizon Wireless and Motorola have come together, announcing the April availability of the MOTO Q 9c, making this the latest addition to keep the rest of Verizon Wireless’ MOTO Q family company. What’s so special about the MOTO Q 9c anyway? 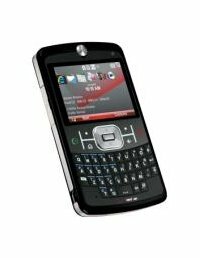 For starters, it boasts Verizon Wireless’ popular VZ Navigator service, and we shall learn more about this business class handset after the jump. Somehow, multi functional tools seem to attract guys like moth to a flame. There is some innate need in us neanderthals to fix stuff around us, which explains why it is always a good idea to open up a hardware shop no matter which part of the globe you’re at. 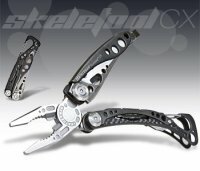 The Leatherman Skeletool CX is a £79.95 tool that claims to offer everything you need in a convenient and small package. To get a better idea of what are some of the tools on offer, head on after the jump for further details. 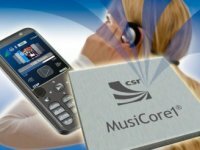 CSR has just launched the MusiCore1 – touted to be the first fully featured single-chip for cell phones in the world that packs both a stereo audio processor and Bluetooth capabilities. What does this mean for the end user? Why, it will help reduce the burden on your pockets as you will actually be able to save (in theory) up to 75% of the cost of an audio processor, in addition to 36mm squared of space which could be used for other purposes. The MusiCore1 is good for up to 100 hours of audio playback, and has the ability to decode MP3, AAC, AAC+, WMA and SBC files, making it cater for most of all casual audio listening needs. It is always fun to report on gadgets that aren’t really gadgets per se, such as this Diary Shower Curtain. There are no electronic parts here, but I would have to say that this item is downright useful. I suppose that this product really speaks for itself. As you can see, someone has gone and invented a shower curtain that you can write on. 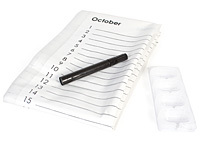 I guess you can write on any shower curtain if you have a waterproof pen, but this one is specifically sectioned off with the 12 months of the year for that purpose. More and more geeks are going to a dual monitor setup to not only provide for me monitor space (real estate), but also because it allows for placing tools and utilities on one screen, while the second screen can be used as an actual interface for editing, drawing and other creative endeavors. Sadly, though, because these monitors are separate entitles, one has to deal with the encasement on both interfering with the unbroken image that can move across both screens. That is, until now. 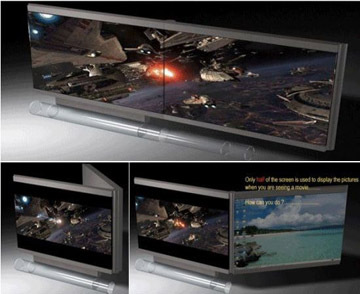 If it gets picked up by a manufacturer, this Double-Sided Transforming LCD Display will enable for an unbroken wide screen image, that can also double as a second separate screen. Wow. In keeping with today’s apparent theme of customizing, hp has just announced three customizable computers in their lineup. The first is the m9200t, which is designed “for the ultimate entertainment experience”. This particular model features an HP Easy Backup button to back up all those files, plus many options including one terabyte (TB) of hard drive space and a Blu-ray DVD writer. There are also some extra storage options including two built-in drive bays for backing up photos, music, and videos. In other words, this model will live up to its tagline. Another big-ticket item is the HP Pavilion a6400z, which has a very low configuration price as low as $299. The options for this is a 1.8 GHz AMD Dual-Core Processor, NVIDIA GeForce 6150 graphics cards, 1 GB worth of memory, a 250 GB hard drive, as well as some software tools for working with video clips and still photos. I’m the kind of guy that loves customizing his computer. No boring beige box and single monitor for me. I’ve got a nice window in the side of the case to show off my awesome hardware and liquid cooling system. The two wall-mounted LCDs help me stand out a bit too. However, one thing I haven’t really thought about is customizing my keyboard. 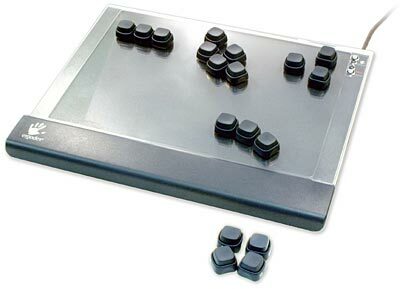 Sure, I can program a few function keys to my liking, but nothing like this DX1 keyboard.